As so often happens, the world is spinning faster than I can blog about it. The baseball season ended, basketball and hockey have begun, football is just starting to really heat up (as the temperature drops) and there's all kinds of cool and exciting stuff going on. While I'm definitely keeping track of it, I'm not finding the time to sit down and write about it all. In a perfect world, I'd have written an extensive season preview for the NHL and NBA seasons the same way I did for baseball, but unfortunately I've been too busy with work and other writing projects. That doesn't mean this blog will stay quiet about that stuff, though. Here's what's happening lately. There's no doubt that the sport with the best writing and analysis on the internet is baseball, there are just so many great sites and great writers covering the game and unveiling new and interesting things almost daily. But, as I'm starting to notice (and am perhaps a bit late in realizing), the interwebs have been springing up more and more great NBA bloggers and writers these past few years. For me, John Hollinger at ESPN is a must-read everyday during the basketball season. I subscribe to ESPN Insider pretty much only because of his work (and also Rob Neyer's baseball blog, where yours truly was mentioned this past summer) and each year my productivity at work takes a nose dive when his in-depth NBA team previews come out before the season. The Pacers made 20 straight shots in the third quarter, and I'm not sure people appreciate how remarkably unusual that was. Using Indiana's 45.7 percent mark on the season, the probability of their making 20 straight shots is ... 1-in-6,333,970. Calling it "unlikely" is the understatement of the century. In all probability, you'll never see anything like this again, ever ... and your children, grandchildren and several generations of descendants won't, either. NBA teams play 328 quarters a season, meaning 9,840 quarters leaguewide. So if the league stays at or near a 30-team alignment, you would have to watch every quarter of every game for about 643 years, on average, before again seeing a team rip off 20 straight made shots to start a period. 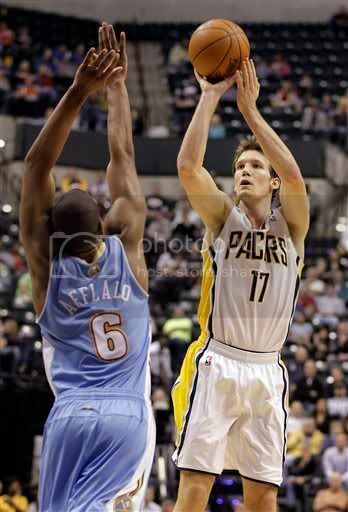 If you were one of the 11,122 people in Conseco Fieldhouse Tuesday night, consider yourself lucky. There was also a pretty amazing finish to the Miami Heat-Utah Jazz game, with the Jazz trailing by 8 points and just 37 seconds to play they hit 4 consecutive three-pointers and then tied the game at the buzzer (on the road!) with a putback from Paul Millsap. Millsap had 46 points on the night and, after having made only 2 three-pointers in his whole career until that point, drilled three straight to help bring his team back. Unbelievable. This is why I love sports. Getting back to the increasing number of great writers covering the game, today I discovered an awesome NBA blog that I've completely slept on called Free Darko. They put out a beautifully illustrated book last year called The Macrophenomenal Pro Basketball Almanac that's received some gushing reviews on Amazon and just recently they released another book, The Undisputed Guide to Pro Basketball History, both of which are now on my imaginary Christmas list. To top off the NBA literature, today I purchased the 2010-11 season preview book by Basketball Prospectus after eyeing some samples and seeing that it's in the same exact format as the almighty Baseball Prospectus annual that I devour each year (I can't get enough of this stuff). Them Prospectus boys are really building a nice little empire. Throw in that Rivers was playing with a mediocre defense, no running game, and an offensive line that caused that running game to collapse, and he probably deserved the MVP last year. Judging by how the voters normally work, that means he should actually win it this year. As an outside, emotionally-unattached observer of the San Diego Chargers this season, I've thoroughly enjoyed watching their entertaining style of play: abysmally sloppy special teams gaffes and boinks that would make a great blooper compilation, tough defense, and the relentless, unstoppable energetic force that is Philip Rivers. It seems no matter what his teammates, coach, or general manager does to help this team lose, Rivers single-handedly wills them to victory. This past Sunday, with 4 of the top 5 receivers on the team's depth chart not playing (Vincent Jackson, Malcolm Floyd, Legedu Naanee, and Buster Davis) and even his favorite target, the unstoppable tight end Antonio Gates sitting out as well, Rivers threw for 295 yards and 4 touchdowns while spreading the ball around an offense mostly populated by cast-offs and practice squad players. Through 9 games this season, Rivers has already thrown for almost 3,000 yards putting him on a relatively easy pace to shatter Dan Marino's single season passing record of 5,084. While Peyton Manning and Tom Brady (and even Rivers' predecessor Drew Brees) are considered the top quarterbacks in the league, Rivers has put up the best numbers the past few years and I've never seen a quarterback who was such an easy bet to drag his team back into a game no matter what collapses they're encountering. When I moved here in 2008 I was disillusioned with the game of football and had pretty much given up on what I consider the most boring (and brainwashing) of the four major sports after my Jets lost 12 games the previous season. 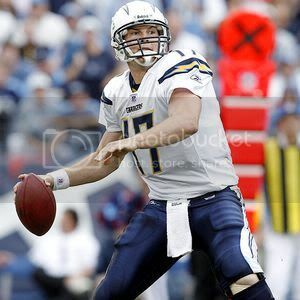 That year, the Chargers started out 4-8 and everybody wrote them off for dead but Philip effin Rivers somehow strung off a victory in each of the last four games and earned the team a spot in the playoffs where they came one win away from the Super Bowl and rejuvenated my dying love for the game of football. The season is over but there have been some very satisfying developments in the Hot Stove thus far. The New York Mets have hired a new GM and, if I could have chosen anybody to run my favorite team, it would probably be this guy: Sandy Alderson. Alderson was the architect behind the late 80s-early 90s Oakland A's dynasty and was the first front office executive to bring the philosophies of Bill James and sabermetrics into the day-to-day operations of a baseball team. He's the one who mentored and passed the baton on to Billy Beane who then went on to have a little dynasty (of playoff appearances, at least) of his own with low-budget, statistically-savvy teams that competed with the high-payroll behemoths in the American League. Alderson has already brought in some great minds like Paul DePodesta (the real star of the book Moneyball) and J.P. Ricciardi to help turn this disastrous franchise around and my latent Mets fanhood has exploded through the roof. I can't wait to see what Alderson does to this team and I will be closely following the Amazins and their machinations while blogging about them as much as possible. In other good news, ESPN has finally gotten rid of Joe Morgan as color commentator for their Sunday Night Baseball telecasts. Morgan's outspoken stupidity led to perhaps the funniest website I've ever seen, FireJoeMorgan.com, in which a group of comedy writers (led by Michael Schur under his pen name "Ken Tremendous") dissected the many insanely dumb things Morgan (and, eventually, other ignorant sports writers) would say in his weekly ESPN.com chats and game telecasts. For years, I've had to watch the Sunday night games on mute because of the stuff Morgan tends to say otherwise I'd find myself yelling at the TV incredulously. The FJM writers took over the popular sports website Deadspin for a day not too long ago and I suggest you check out some of the gallimaufry they engaged in over there because it's pretty hilarious. Probably because I haven't played the sport myself in over four months after consistently playing in intramural men's leagues two days a week for years, I haven't really gotten into hockey yet. But today the NHL made an announcement that they are completely revamping the format for their All Star game this year and it sounds pretty damn cool. Just like a game in the street, the players will choose who they want on their team. First there will be two captains selected for each squad and those captains will then pick the players they want. The All Star games for all four sports have been in need of some revitalization for a while now and I'm proud of and very impressed with the NHL for their creativity and originality here and I look forward to seeing how they plan to actually do this whole thing. Should be fun. I'm sorry I didn't find out about FireJoeMorgan.com until now. The illiteracies and inanities of sports (and other) commentators need pointing out. I should know this; I am a newspaper copy editor. FJM is a goldmine not only for calling out professionals for not doing their job but for hilarity too, it's shame the site is no longer active. The main writer, Michael Schur, is probably too busy doing his day job (writing/producing "Parks and Recreation"). I may look for those stupidity sites. Then again I may not. That much of a busman's holiday, I don't need. Not stupidity, but I was gobsmacked to see this evening that the Major League Baseball Network ranked Honus Wagner's 1908 season just eighth on what looked like a list of greatest offensive seasons ever. Bill James makes a persuasive case that Wagner's 1908 season was the best by any player in the twentieth century and, when in doubt, I'll always go with Bill James. I learned two new terms from your last comment (busman's holiday and gobsmacked) so thank you. The talkers (that's all they are) on MLB Network don't know the first thing about comparing player seasons across different periods of time like that. Wagner was so far ahead of the rest of the league in those days, hitting like A-Rod in his prime in a time where they kept the same baseball in play until it was as flimsy as a hacky sack (the Dead Ball era). From the shortstop position, no less. It's a shame, baseball seems to be the sport with the worst mainstream coverage. There are maybe a handful of baseball television personalities that are any good. I gave MLB Network a bit of credit when I heard about its shortstop rankings. If this had been ESPN, they would have ranked Ripken or, god forbid, Ozzie Smith number one. But Wagner was ranked first, and Arky Vaughn was on the list. They probably overrated Ozzie and Ernie Banks a bit, bit it wasn't a bad list. I didn't hear what they said about Wagner (this is America and I was in a bar, so naturally about twenty TVs were on at once), but you're right: Wagner was miles ahead. One can argue over who was the best at just about every other position, but not shortstop. And you're welcome re gobsmacked and busman's holiday. Enjoy using both terms.